Christmas is one thing, but the most devout Christians will tell you that Easter is the holiest day in the calendar year. It’s odd then, or perhaps typical, that it took horror filmmakers a long time to give Easter the same treatment given to Christmas, Valentine’s Day and Halloween. In recent years, they seem to be making up for that. Though if you notice, the twist on Easter-themed horror is often bunnies and eggs and not the holiday’s religious connotations. 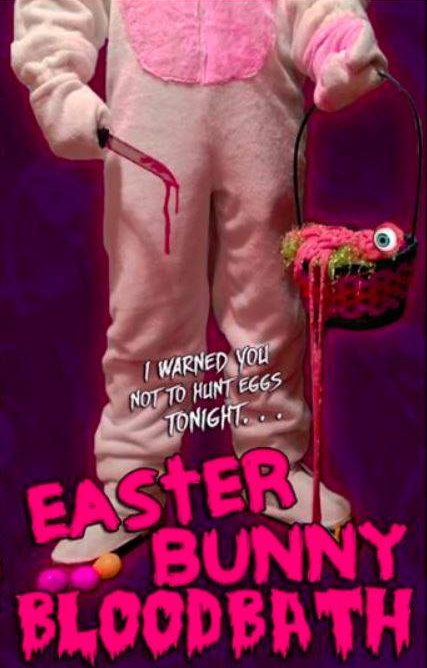 EASTER BUNNY BLOODBATH is one of the recent SOV films that fits into this category and it fares better than most, thanks to some decent characters and a good sense of humor. The film starts out in the 1960s. Peter and his sister are splitting their Easter candy when little Peter spots the Easter Bunny(obviously and intentionally looking like a cheap costume) waving to him from the outside. He and his sister gleefully open their door, only to have the towering critter lop off the girl’s head. Flash forward to 1987 and Peter (Shayan Bayat) has few memories of the incident. A helpful title card also informs us that he is “no longer white.” He returns to his old family home on Good Friday, bringing along his friends for company. But an ill-advised prank causes Peter to freak out a bit. As Peter looks outside into the woods, he swears he can see the Easter Bunny, lurking on the property. But is it a figment of his imagination or an old childhood enemy come to finish Peter off? Yes, True Believers, what we have here is a slasher comedy inspired by HARVEY. As previously mentioned, the cast of of endearing characters keeps things interesting. You know that few if any will make it out of the woods alive, but you still care a little more than your ordinarily would in this type of production. Perhaps it’s because the cast elevates the characters beyond stereotypical prototypes. One major exception to this rule: Chris J. Clements as an overzealous and possibly non-deputized ranger. While some of his actions are funny (love how he writes a ticket), Clements’ performance is too broad even for a film about a six-foot tall killer rabbit. It’s the kind of performance we’re used to seeing, clashing with EASTER BUNNY BLOODBATH’s tendency to cheerfully mix other elements up. Director Richard Mogg inserts fantasy sequences and interesting directorial touches that keep things lively and interesting. This gives the film a wicked sense of humor. But EASTER BUNNY BLOODBATH isn’t all chuckles. In fact, the film veers between all-out comedy and some very dark moments of pathos and horror. EASTER BUNNY BLOODBATH is both an SOV horror comedy and a salute to the aesthetic that originally made these types of films possible. It’s no classic that will be mentioned in the same reverence as MY BLOODY VALENTINE or SILENT NIGHT, DEADLY NIGHT. But it’s not unlike a dark chocolate cream egg. Sweet and gooey on the inside, dark and bitter on the outside. Recommended.